33 Shades of Green: Mapping It Out. . . I found three frames this week at Target on clearence for $6.24. I couldn't pass up the deal, so I decided to frame a few maps I have from my trips to Italy. 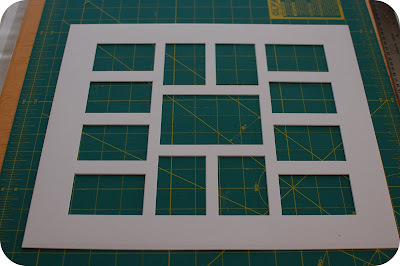 The frames came with mat board cut to frame several pictures. Not what I wanted for my maps. 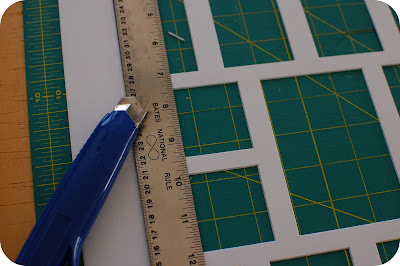 I used a metal ruler and my exacto blade to cut off the center portion of the mat board. When I finished, they looked like regular rectangular mat boards. Next, I choose the maps I wanted to use. I found my three favorite and cut them to size. 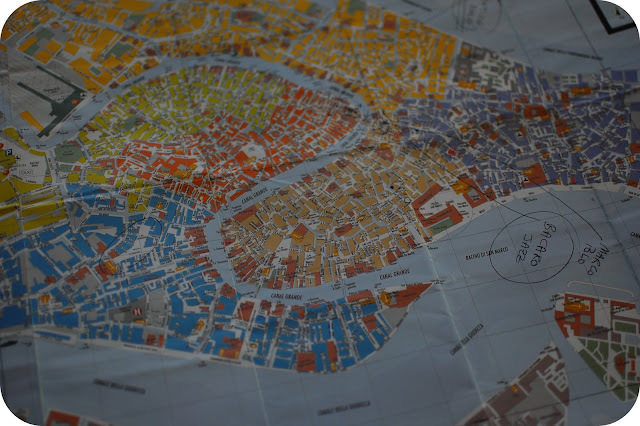 The maps all have crease marks in them and the Venice one actually has some writing on it, but I sort of like them that way - it reminds me of our trips and walking the cities. The writing on the Venice map is from Gigi, a worker at our hotel, pointing out some of the best spots in the city for a spritz! Gigi did not disappoint! I hung the maps up in my home office. When I hang a group of pictures, I always use the paper that comes inside the frame to decide where to hang the pictures. 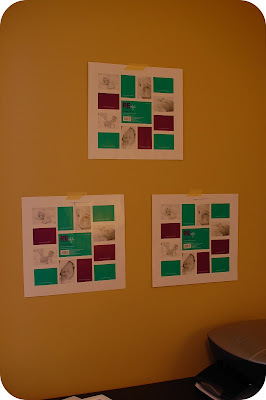 It's a really easy way to make sure you are hanging your pictures exactly where you want them. I pound the nail right through the paper. I think this method saves a lot of time trying to find the correct spacing for the nails. 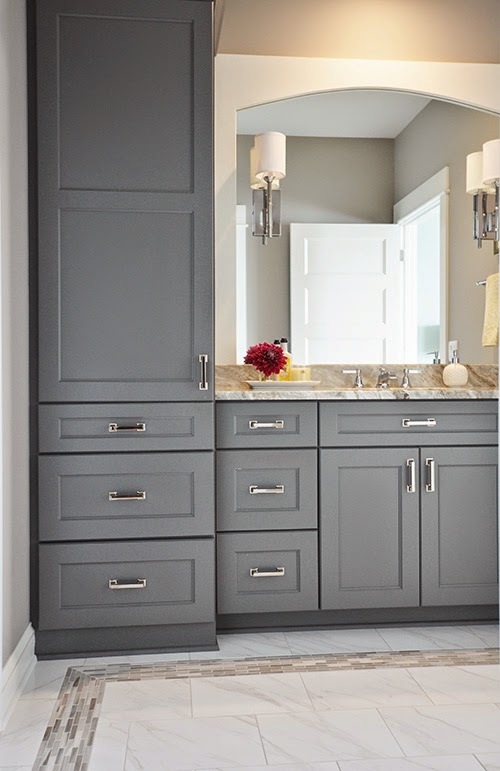 I am linking this up to Remodelaholics Anonymous Friday's here. Check it out! 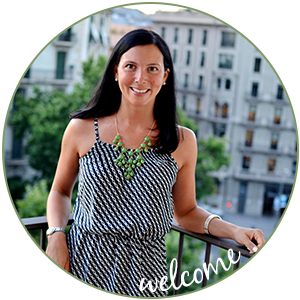 Also linking up to Frugalicious Friday's @ Finding Fabulous here. And to Make it for Monday @ Cottage Instincts here. And to Trendy Treehouse here. And to Funky Junk Interiors here. 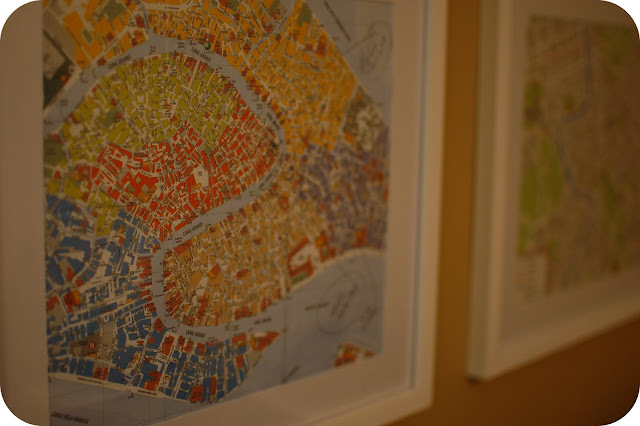 I love the wall color in your office, and I like the maps, too. 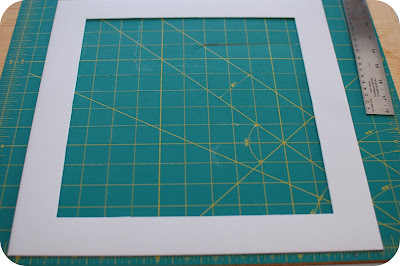 That really is a great idea about the frames--I never though of using the multi frames by taking out the mat. I have a few maps from my travels I think would look great as well. Love the one showing the country. I love using maps too. I hug a map of the USA (even though we are Canadians - gasp!) to remind him of the wonderful memories of our time living in Virginia! 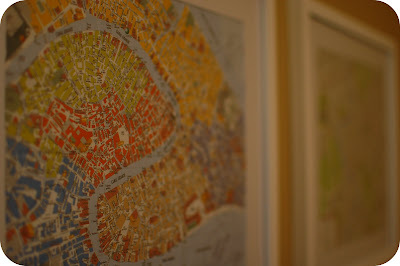 In our office I have framed map postcards propped on the bookcases. I love how you framed and hung yours! I should totally do this... our Target had a bunch of frames on clearance in the $3-7 range, too, but I didn't want all the little holes and didn't think to cut the mat up... I will have to go back! 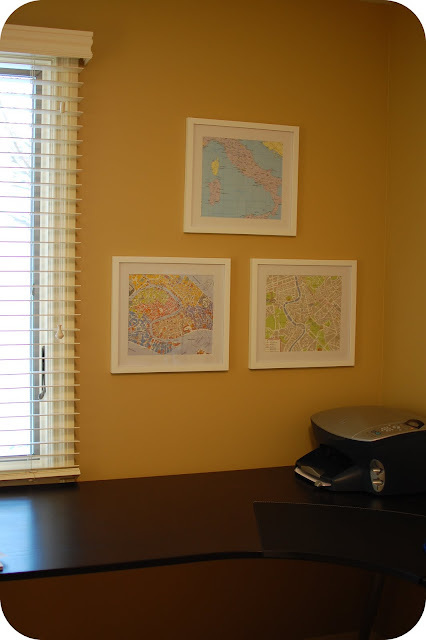 I love maps, and this is a fabulous idea...especially for a home office! Great idea, thanks for sharing and for linkin' up to Frugalicious Friday! those are great! love the idea for the tip to hang them too! 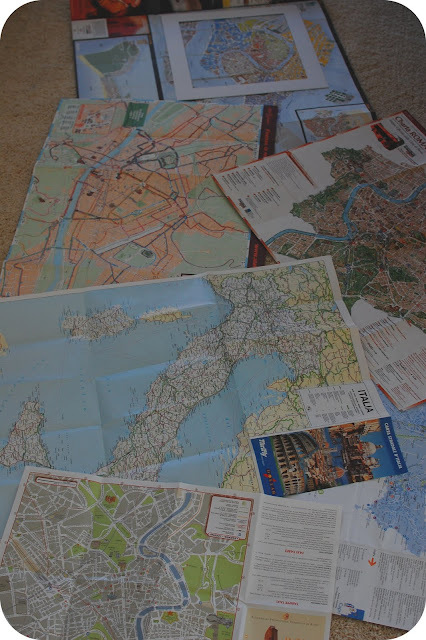 Oh, not only do I love the maps idea, and the good deal on the frames, but I am now seriously jealous of the trip to Italy! Great job, join us again next week. I always love your projects! What a great idea. I've always loved maps. I think I will have to use this in my living room makeover. Thanks for the inspiration. I just read further down, and will definitely use the nail through the paper idea. So simple, this is the first time I have ever read this on anything about picture hanging. Great idea! I love how these came out! Better than the ones in the Pottery Barn catalog for sure! Thanks everyone for your nice comments! I'm really enjoying the maps in my office - Unfortunately, I spend a little too much time looking @ the maps and reminiscing, when I should be working! Eh, mediocre idea at best. Haha, just kidding Beege, I LOVE this!! And am now extremely jealous to find out that you ended up with the map that had Gigi's handwriting on it...just stuffed that in your bag when you thought I wasn't looking, huh? 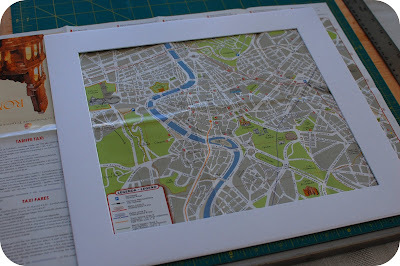 I love the idea of framing maps and they look AWESOME! Wow! Such a great idea! I love the small pops of color the maps bring to your wall. Great idea! 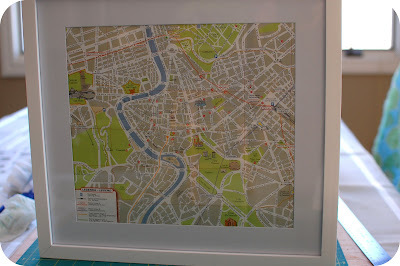 I have so many maps from when I lived in Paris that I could frame. Thanks for the inspiration! Hello, just found this post and it's exactly the inspiration I needed. Have a lot of maps from Scotland, California and orienteering in the U.K. too. And a new house to decorate and personalise. 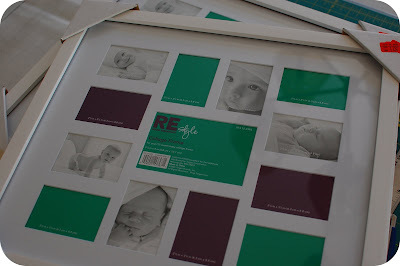 Love how you use the insert to place your picture - very clever! I'll be linking back to you from my blog on this topic soon thanks! Great idea - thanks for sharing!